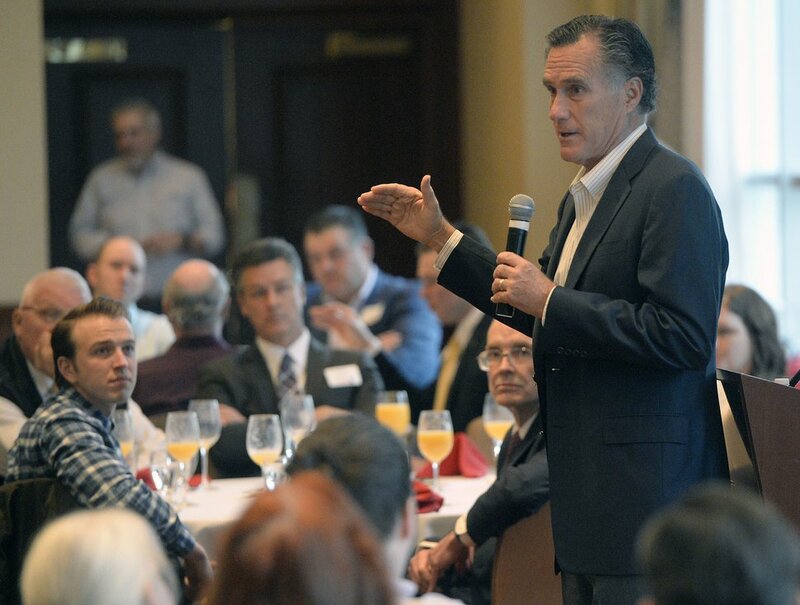 (Al Hartmann | The Salt Lake Tribune) Republican Senate candidate Mitt Romney speaks and answers questions at an informal breakfast with state delegates Wednesday, March 28, 2018, in Salt Lake City. GOP Senate candidate Mitt Romney fleshed out his public stand on U.S. immigration policy Wednesday — this time suggesting a “merit-based” system to favor those who have the skills and resources most likely to help build the country. The talk about merit-based immigration comes after Romney attracted attention earlier this week by opposing any special pathway to citizenship for “Dreamers,” the people brought illegally into the country as children by their parents, and said he is “more of a hawk on immigration” than even Trump. 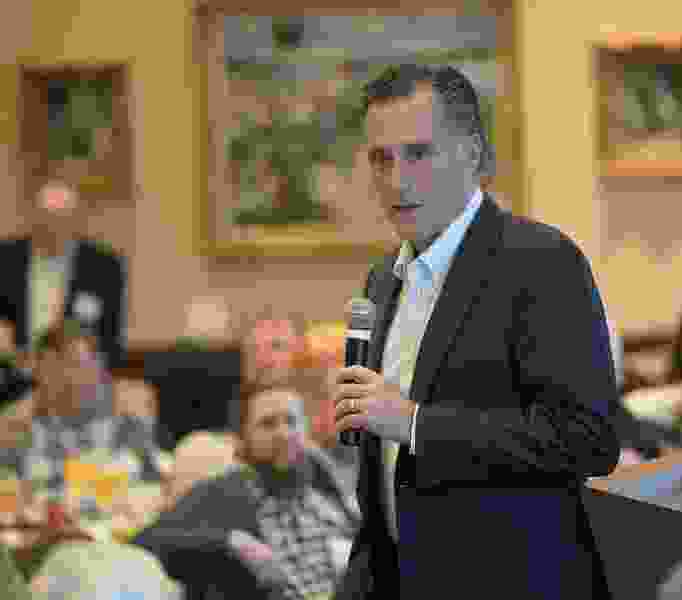 The latest twist came as Romney fielded questions Wednesday in Salt Lake City at the Marriott City Center from a group of about 150 GOP delegates — who tend to be more conservative than other Republicans — and several asked about immigration. “I don’t know that I’m ready to define it in great detail,” Romney said Wednesday, but he offered some examples of what might be included. Would-be immigrants would register and earn points toward legal immigration based on several questions. Wilson said Romney is “doubling down” on murky proposals by Trump. “I think this on-the-fly approach is not helping” to solve immigration issues, including how to deal with Dreamers — for whom she favors a direct path to citizenship. Romney told delegates on Wednesday that when he was the GOP presidential nominee in 2012, he opposed giving Dreamers legal status. But he said President Barack Obama gave it to them through an executive order, called DACA, and Democratic and Republican leaders in Congress also favor allowing them to stay. “So I will support the posture of our president and leaders of both our parties that DACA individuals should be granted legal status,” he said. In fact, he added, “I’m frustrated that we can’t get it done” legislatively. Still, he said he wants no special pathway to citizenship for Dreamers. “I think they ought to get in line with other people who want to become citizens,” even if they have continuing legal status to be in the country. Romney outlined other stands including favoring allowing temporary immigration for agricultural workers — saying Utah could not harvest its crops without that — and opposing any government benefits to illegal immigrants. He called for strengthening borders, but restated strong support for legal immigrants. State Rep. Mike Kennedy, R-Alpine, who is challenging Romney for the GOP Senate nomination, also took a swipe at his stands. “The problems we’re facing with immigration and DACA are shining examples of a government-created crisis made by establishment politicians who are refusing to enforce current laws or lack the backbone to create new policies to address issues,” he said. Clarification: This story has been modified to recognize that Romney has previously supported a “merit-based” immigration system, as reflected in his position statement on his campaign website.